In my previous piece, “Traditional Wisdom of Child Development”, I looked at how contemporary social scientists are rediscovering some of the wisdom of traditional hunter-gatherer societies, which were for most of our time on this planet the predominant human organizing principle and are arguably a more natural form of human community that the high-technology society that most of us humans live in today. It’s not that I disagree with what you’re saying… but the immersion-type parenting you’re talking about is, quite literally, impossible for many people in modern American society. Two (or more!) incomes have become necessary to cover even basic expenses for families in many places, and I just don’t see that changing anytime soon. So the question then becomes, how can we accomplish raising children in an “immersive” fashion when we are forced to spend the vast majority of our time away from them? And how can and should teachers respect these basic principles of child development in the face of ever-increasing scrutiny, judgement, and standardization? I think this is a well crafted “problem statement” for a key challenge we face as a society. We (or at least our predecessors) have built a society where though we are free citizens and not slaves or indentured servants, many of us have to work so many hours to earn a living wage (if we can at all) that it constitutes a de facto indentureship. Add to that that the massive scale of our society with the disenfranchisement and alienation it breeds, combined with perpetuation of ancient patriarchal “us and them” values, creates a subculture among us that is predatory toward out groups (“them”) particularly poor people, minorities, women and young people. The latter in particular making it problematic for parents to let the “village raise the child”, sequestering kids instead in “schools”, institutions that paradoxically isolate kids from the dangerous real world while trying to prepare them for it. So given the problem statement, what is the solution, or at least a path forward towards a solution? 1. All forms of hierarchical “us and them” thinking that create a “pecking order”, where people higher up in that order control and are responsible for the people “below” them. Particularly in this vein, the trivialization of young human beings as incompetent because they are “just children”. 2. Most all forms of privilege that derive from the above, including race, gender, age, sexual orientation, economic status, talent, and formal education (political progressives being particularly guilty of the latter, leading towards enlightened despotism rather than true egalitarianism). Kind of a gray area perhaps when it comes to “respecting your elders”, but the respect should be mutual. 3. Given the massive scale of our society, the top down control model that allows for very little real governance at the local or community level, in favor of decision making in far away capitals or by national or international business interests. 4. The perpetuation of Calvinistic principles of the martyrdom of “living to work” rather than “working to live”, that drives so many of us to sacrifice life balance in favor of economic gain, that contributes to the separation of adults from children and the economic stratification of society. 5. The materialism that underlies a consumerist “shop ‘til you drop” society that in many cases values possessions over human development. 6. A recognition that we live in a dysfunctional society if we generally feel our neighborhoods are unsafe for our young people to navigate without adult chaperones and we feel powerless to change that. So once we move beyond denial of the problem, how to address it? How do we reintegrate the child-raising wisdom of our hunter-gatherer kin into our high technology civilization? Have we truly boxed ourselves into a corner where the complexity of our society forces us to be controlled by others who are more capable and “expert” than us, and in turn forces us to control our children during our perception of their extended incompetence? Or can we use all our accumulated wisdom and know-how as functional beings in a complex world to come up with a contemporary reimagining of a more developmentally rich approach to raising our young people? A thought so deliciously counter-intuitive and insurgent for all of us enmeshed in all these layers of 5000 years of “civilization”! So how does our small committed group start reimagining how to keep our very young children closer while letting them loose (or at least looser than most are now, perhaps “holding close with open arms”) once they master the ability to walk and talk? There are probably any number of potential ideas on this depending on our circumstances, with each of us with different degrees of economic privilege and more or less enmeshed in the economic control of others. Certainly giving credence and visibility to the “alternative” traditional parenting wisdom of hunter-gatherers toward infants and toddlers would be a start. In our culture we conventionally separate infants and toddlers from ourselves in their conveyances, sleep arrangements, and daily routines, as if they are precious but foreign objects that don’t quite belong in our world yet. 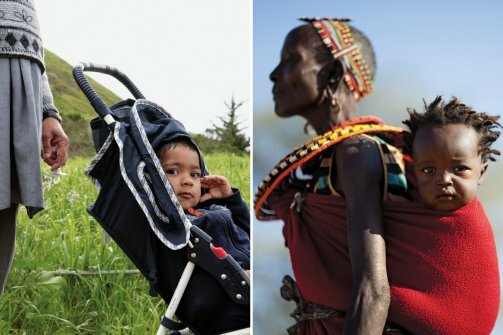 Whereas in hunter-gatherer cultures their youngest are often strapped to a parent or other adult’s back during the day, viewing the world in front of them from the upright active point of view of an adult, rather than the passive cloistered point of view reclining in a stroller or confined in a playpen. And at night our culture’s conventional wisdom is to have young ones sleep in their own cribs rather than with their parents. An interesting case in point in our culture is how the nature of much of our work has forced a separation between infants and toddlers and their parents and other potential caregiver family members. Unlike in hunter-gatherer societies, much of the work we do is done far from home, economic realities often compelling both parents with very young children to work outside the home. And with societal conventions also separating extended family members from parents, little ones are often sequestered during the day in day care. Not that day care providers cannot be as effective caregivers as parents and family members, but they generally provide care to a handful of little ones per caregiver (for economic reasons) so that care tends to be more cloistered and passive. Add to this that many little ones are transported some distance to day care in cars, where their special car seats, designed for maximum safety, don’t allow them to share the adult point of view (that the young person has travelling on mom or dad’s back), but instead constrains them passively in back seats with little or no view of the world passing by. Cloistered and passive. Unlike hunter-gatherers our little ones lives are so constrained and restrained! There are current trends in our high-technology society that could facilitate returning parenting infants and toddlers back to a “contact sport”. With increasing connection of homes to the internet, many “knowledge workers” and administrative staff can do all or at least some of their work from home. Combine with this an egalitarian trend in our society which includes men playing a more active and extensive role in parenting, allowing either mom or dad, if in such jobs, to each work a day or two a week from home. When my partner Sally went back to work after her maternity leave, I, with my recently acquired computer programming education, was able to find work from home while being our infant child Eric’s primary daytime caregiver. Though Eric was mostly not on my back and cloistered in a playpen or baby swing while I sat at my computer, he was always in sight and we were constantly exchanging looks and I would comment on his play. I also would take several long breaks during the day where I slung him on my back and we walked the neighborhoods around our house, Eric able to see the avenues from his dad’s point of view. The fact that Eric emerged from his toddlerhood as a confident and assertive young child could be a coincidence or maybe not. Of course there are a range of other jobs, particularly low-paying ones, that involve working at some sort of store or other establishment doing physical labor and/or serving customers. A century ago many of these were family businesses attached or close to home, with family members doing the work and able to be close to their very young children. Today much of this work is done at remote shopping malls and low-wage working parents, given limited financial resources, are challenged to find even adequate passive and cloistered daycare for their kids. Fifty years ago when I was a child, most (at least middle-class) families had one parent, the mom, at home with the young children. Pay for work and the cost of living were such that one living-wage job could support a family. An “innovation” of recent decades is that for many families with two parents, both need to do paid work outside the home to make ends meet, further separating parents from their young children. Again… hunter-gatherer societies differ from our own because they generally keep their infants and toddlers closer to parents and other caregiving adults while allowing children who have learned to walk and talk much more autonomy to lead their own lives in the real world. While keeping infants and toddlers close can be challenging in high-technology society, letting them “loose” after toddlerhood in our typical contemporary urban and suburban environs can be nigh on impossible. Crossing streets with speeding cars is dangerous. Unsupervised children can be victimized by predatory people, or when in need of help, not be able to find assistance or contact their parents or other concerned adults. Having constant adult supervision of children is pretty much a no-brainer, right? This is a reality of modern existence that we basically have to accept in exchange for all its pluses, right? Right… but step back a bit and ponder what we have accepted as given and beyond our control. We live in a child-unfriendly society where many work venues are not appropriate for children at any time (except maybe a once-a-year take your child to work day) and other venues are only appropriate for children that are closely supervised by adults. Whereas in hunter-gatherer societies children often help their parents and other community adults with their work, in our industrial society “child labor” is something progressive people have worked for over a century to eradicate, and with good reason. Work in the industrial age is often a nasty business, barely even suitable for adults, let alone children. One of the main reasons we started in the industrial age and continue today to try to cloister all our kids in schools every weekday, and make their attendance mandatory by force of law, is to try to keep them safe from the real world and all the danger and exploitation that we have come to accept or at least begrudge. I have my perspective on this issue because I was a kid blessed to grow up in the child-friendly mid-sized university town of Ann Arbor in the 1960s with parents unorthodox enough to trust me by about age seven to head out on my bicycle about town on my own as long as I promised to come home when the streetlights came on. Thirty years later raising our own kids in the megalopolis of Los Angeles, there was no way I would let my seven-year-olds do anything remotely like that. It wasn’t until age 16 when they had learned to drive and had their drivers licenses that such independent excursions were even considered. Well Los Angeles is not Ann Arbor, but even in the latter locale today, society has “advanced” enough that I would be surprised if any parents let their seven-year-olds loose on the streets. The wisdom of hunter-gatherer societies is that as soon kids can walk and talk with reasonable proficiency and range, letting them participate freely in the real world of life and work allows them to start functioning like autonomous people… you know… like adults. They are not yet expected to be adults, but they are given the respect and autonomy to be treated as a lot more than irresponsible “children” that need to be constantly supervised. So given that we cannot transform the bulk of the venues of our society overnight to be more child-friendly and less dangerous, exploitive and predatory, there is at least one institution that could be transformed to offer young people a venue for autonomy and at least a small approximation of the real world. But not as they generally are now! Instead as visionary educators from the early 20th century like Maria Montessori, Homer Lane, A.S. Neill, John Holt, Ivan Illich, and Francisco Ferrer reimagined them, to fully facilitate human development. And as their current disciples, including Yaacov Hecht, Daniel Greenberg, Zoe Readhead, Sir Ken Robinson, Chris Mercogliano, and others struggle to manifest against a strong headwind of educational standardization driven by a vestigial industrial mindset promoted by the education-industrial complex and the huge business markets for textbooks, testing protocols and other supplies that those standardized schools represent. Consistent with these great progressive thinkers on human development, we are imagining schools that are mini-worlds with as many aspects of the real world of a democratic high-technology society that can be incorporated. Milieus where kids can come and chart their own course, rather than having others define their course like almost all schools do today – learning about charting ones course rather than actually doing it. The expectation that everyone is responsible for themselves and directs their own life is a key principle of liberty in our egalitarian society but something that is rarely applied to children and youth in our culture or most other “civilized” societies. Perhaps the flagship of such a reinvented learning venue for young people is the boarding school Summerhill in Leiston, Suffolk England. Admittedly it is not a public school, since the youth empowerment model it follows runs counter to British standards for publicly funded schools. But it represents a real learning community where young people and adults can come, lead their lives, pursue their interests and continue with their development. A place where there is no script for learning, no place you have to be at each hour of the day, but lots of interesting venues within its campus where you can. A place where the young people are not in mortal danger (like on the streets) but are in jeopardy of having to decide each day what they are doing, when, with whom, and where (at least within the campus of the school). A place where they are “citizens” of the institution, with a vote on all important school decisions and as much opportunity as any other youth or adult in the school to participate in a significant way in running the school. A deep effect on the quality of the relationship between adult and child. Artificial barriers are soon dropped, allowing for more honest, direct communication. Everyone is able to be more themselves and to be relaxed with each other. The adults do not strive to set examples for the children. We go about our business naturally, unhindered by stances of stiff dignity or condescending paternalism… Each of us defines our own boundaries in our own way and becomes involved in community life at our own level. The way that we live live together with the children is functional, defined by personal choices and needs, rather than abstract morality and conformity to unnatural norms. In attempting to reacquire the wisdom of the hunter-gatherers, it may not be appropriate in our complex and in many ways dangerous society to let our children loose in our “real world” to live their lives and develop as they choose. For those of us with a certain degree of economic privilege, we can send our kids to alternative private schools, or we can liberate our children to “unschool” and learn life and work skills side by side with their parents and other adults and young people we can facilitate bringing into their lives. But for those of us without such means, or for whatever reason not able to let our kids experience the workday worlds of our lives while living their own, the developmentally reimagined public school (now more of a youth community center actually) seems a compelling alternative. In the cloistered environment of a school it seems totally natural and appropriate to me to create a rich environment of options and empowerment, then set them free as active rather than more passive participants in these mini-communities. Given our current child-unfriendly real world, what better remediation for kids to learn how to be actively functioning citizens able to navigate expertly in our high-technology democratic society, since as they say, “practice makes perfect”. Though I have not directly experienced and only read extensively about democratic-free schools in practice, as a parent I have withessed a version of this sort of youth-adult egalitarian environment directly as it is created at Unitarian-Universalist high school youth camps (see my piece “Camps, Cons & Compasses”). The few adults that are there are in a facilitative role in the background, contributing their thoughts and expertise when asked. Many of us with economic privilege have always understood and had the means to implement this wisdom of hunter-gatherer societies, that the sooner we can empower our children to play the key role in navigating their own lives the more quickly and the more completely they develop, and the more readily capable they are to assume important (particularly leadership) roles in the adult world. For people with the means, traditionally this has involved employing tutors or sending their kids to the elite private schools (the top “tier” or our country’s de facto three-tiered school system) that can create such environments for self-direction within their privileged context. Add to that in recent decades a very small but growing number of democratic-free schools, which like the Summerhill School in England, generally have been constituted as private rather than public schools, because they don’t teach a standardized curriculum, instead by design letting each of their students explore their own. Plus an even more recent trend among people with the network and means to “unschool” their kids, and let them start functioning as real people directing and responsible for important elements of their real lives, rather than being instructed about life in conventional elementary and secondary schools. But for kids from families without that economic privilege, their only option may be conventional public schools, with their standardized, regimented, mostly externally-directed instructional focus. Certainly they provide kids the opportunity to learn the basics of the four standard academic subjects – good information to know – but generally give them little or no opportunity to get behind the wheel of their own development. This lack of opportunity to decide on and drive each activity of their daily lives (as adults do) may in fact be handicapping many of these kids in their development, and contributing to the perpetuation of their second class status in society as adults. Adultesence might be just the opposite: not evidence of progress but another sign of a generalized regression. Letting things slide is always the easiest thing to do, in parenting no less than in banking, public education, and environmental protection. A lack of discipline is apparent these days in just about every aspect of American society. Why this should be is a much larger question, one to ponder as we take out the garbage and tie our kids’ shoes. As a parent who was guilty at times of “letting things slide”, particularly while we were still requiring our kids to attend conventional schools, I think their lack of full engagement in those schools contributed greatly to some “generalized regression” on their parts. I felt the daily need to compensate for the fact that I was forcing them to spend their days at a school they would not choose to attend if given their own choice. Finally we reconciled with the unorthodox educational approaches of homeschooling and unschooling, and let our kids choose not to go to school. For both of them, after a difficult year of deprogramming and testing the extent of their new freedom, they began to live and direct their own lives, and the pace of their development took a noticeable leap. Again, a degree of economic privilege allowed us the option to take this unorthodox course, but for many of their peers caught in the same school malaise, but with less means, they did not have this option. They continued in conventional schools, some coming into their own, but others floundering while still others were hounded by their parents to do well academically, neither course contributing much to their internal development, as far as I could see. Let’s give all our kids, not just the ones from families with means, this opportunity to follow the rediscovered wisdom of our hunter-gatherer kin! Given the increasing complexity of our society, aren’t we crippling our future if we don’t give all our young people access to the most effective environment to develop in? An environment of self-direction that is our natural human state of engagement with the world, somehow lost in all the trappings of our contemporary civilization.